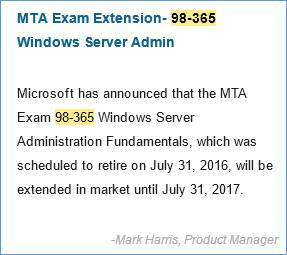 98-365 Windows Server Administration Fundamentals Retired or Not? So on the MS site it said the test expired on 7/30/2016 now its saying its not retired. Anyone know whats going on with this test? 3 days ago it was listed as retired which is why I'm asking, was listed on the ms cert retirement list and listed as retired on the main page for the 98-365 exam. Regarding to this, [FONT=wf_segoe-ui_normal, Segoe UI, Segoe, Segoe WP, Tahoma, Verdana, Arial, sans-serif]register is possible. [/FONT]Emailing to certiport and this is respond. This is good to know as I am studying this now. the 365 is based on 2008 which I am assuming this is why they would retire. i never realized it was expiring in July 2016. I am glad they extended. there is not much study material out there, but the sybex book by tom carpenter has very good information to learn. It is a good review for me. So will there be another exam using a newer version? I only ask this because after I finish the Linux+ I was planning on doing the MTA Server course, followed by the MCSA, then ultimately the MCSE. I don't know, but if you finish up your Lin+ this year, it should give you enough time for that MTA before it expires. FYI, that MTA is based on Windows Server 2008. Thanks. How long roughly would it take to pass the MTA Server Fundamentals course? I'd be self-studying it as I do with all my certs. If you have absolutely no Windows Server experience, maybe a month or two? Out of all the MTA exams I've taken, it is probably the most "Microsofty" out of the bunch. It's not on the level of the MCSA Server exams in terms of difficult questions, but you really do still have to know your Windows Server concepts to pass it. That's a big help thanks again. I don't see this as expiring any longer. Any idea?